The proposed project adheres to the local Planning Ordinance and Planning Policies and is subject to necessary planning applications for development. The hydrogeological environment was assessed during January 2002. Geophysical logging techniques including depth versus salinity and temperature profiles were employed to ascertain the groundwater configuration in the existing feedwater borehole. A low volume hand pump was used to obtain a composite water sample. The sample was analyzed for selected chemical paramters and bacteriology. Data collected was used to assess the groundwater configuration and water quality. Pump test analyses from boreholes in similar hydro-geological environments in the Bahamas were used to get a feel for borehole abstraction criteria and performance at deeper depths in the subsurface that are applicable within the project site. The proposed project site is located approximately two miles north[east] of the Grand Turk International Airport. It is situated along an interior ridge formation that runs parallel to the eastern coastline, adjacent to a large Salina on the western side and a valley on the eastern side. The site comprises approximately 22.898 acres of land and is under ownership of Dominion Ltd. It is positioned at Block Number 10406 and Parcel 20 on the official cadastral plans for Grand Turk. The immediate and surrounding areas, described as the "outskirts of town", are dominated by an extensive Salina due west of the project site and a ridge and valley system to the east. The subject area is designated for commercial and industrial usage. It is serviced by underground service utility infrastructure. The eastern coastline is approximately [0.75 km] east of the project site. Stunted vegetation occurs in patches across the site and is interrupted by derelict infrastructure, near the southern property boundary, from the previous development that comprised a hydroponics farm. A small diameter (6-inch) borehole of approximately 50 feet depth exists in a sheltered stonewall structure. The perimeter of the project site is secured with chain link fencing and barbwires. Rough, rocky roads provide accesses at the north and south boundaries. The Salina near the western boundary has no direct tidal connection and is recharged by local rainfall. Currently, the project site is used, indiscriminately, for the grazing of livestock, namely cows. Grand Turk Island has developed on the southern margin of the Turks and Caicos Banks that is contiguous with the Bahama Banks. It's geology is dominated by poorly to well cemented Pleistocene limestone and uncemented Holocene sands. The geological evolution of the area under study is defined by a single sea level notch and isolated, elevated beach ridges that were formed during episodes of sea level rise and fall over time and aeolian deposition of sediments, respectively. The geomorphology of the project area is comprised of an interior ridge formation oriented from north to south. Geomorphological features indicative of active or inactive faults, folds, joints or other structures associated with tectonic activity were not evident within the site or immediate and surrounding areas. Therefore the geological evolution of the project site may be best understood within the context of sea-level fluctuations over geological time. The soil layer above the limestone outcrop is extremely thin, less than one inch thickness. Paleo soils were not observed within the proposed development site. The current soils are dominated by calcareous and organic materials and occur as tan, brownish, very fine grained materials. Soil moisture is characterised by frequent wetting and drying due to high effective porosity of the underlying carbonate landform and modest amount of rainfall. The hydrogeology of Grand Turk and the proposed project site is characteristic of a semi-karstic environment. Surface water bodies do not occur within the project site. Groundwater occurrence, in general, is characteristic of a Ghyben-Hertzeberg lens where there is a layered configuration freshwater, brackish water and salt water, respectively from near land surface to increasing depths. The groundwater lens is unconfined. However, a freshwater layer does not exist within the proposed project area. Groundwater recharge is primarily derived from local rainfall. Groundwater flow direction is from the center of the island out toward the coastlines. A single water quality sample was collected from the existing borehole. The water quality results indicate the presence of bacteriological contamination in the local groundwater regime. The water quality data is summarized in Table 1. The salinity measured in the existing borehole averaged 34.4 ppt and was very similar to average salinity of the surrounding marine environment. The temperature profile (Table 2), while characteristic of a reverse geothermal gradient, did not yield expected results ranging around 24°C–25°C as have proven to the case in other boreholes of similar depths throughout the Bahama Platform. Four parameters have been considered in determining the key issues under the proposed project including impacts on air quality, groundwater, land and socio-economic environments. The proposed [drilling] project will not comprise fuel storage, fuel burning facilities or other type facility that will generate emission into the air. Therefore, no perceived impacts to humans, animals or air quality have been identified. A freshwater lens does not exist within the immediate and surrounding area of the project site, thus saltwater encroachment will not be an issue. The proposed project site was previously developed. Existing road networks are sufficient to provide unobstructed access to the site. Within the project site, natural terrestrial habitats for resident species will not be physically disturbed or lost. However, the method of construction of the boreholes will be an issue. Drilling methods that allow indiscriminate flow of saline water on the ground surface will adversely impact already stunted vegetation. Perceived socio-economic impacts will not be an issue. However, it is important to note that the successful implementation of the proposed project will effectively improve the quality of life of local residents through the creation of employment opportunities. Employment opportunities bring about economic stability to a current unstable socio-economic situation that has resulted in mass exodus of local residents to other islands in search of employment. Perceived adverse impacts may be mitigated through the application of appropriate mitigation measures and should not impede the progress of the proposed project. Pump tests and the evaluation of pumping test data have been conducted throughout the Bahamas and the Turks and Caicos Islands with a view to determining the "safe yield" of freshwater lenses. The concept of "safe yield" was used to identify abstraction criteria for the sustainable use of a fragile potable groundwater resource. Against this background "safe yield" averaged 10 US gallons per minute or approximately 15,000 US gallons per acre per day. However, in the case of the proposed project, the target resource is saline groundwater abstraction from a groundwater regime that is void of a freshwater lens. Consequently, potential damage to fresh groundwater bodies is a non-issue. Furthermore, borehole design would prove to be the critical factor in determining satisfactory rates of abstraction. The current environmental protection policy of the Turks and Caicos government calls for the discharge of wastewater and/or brine from desalination plants to be by means of subsurface injection. The proposed project will utilize abstraction and disposal wells within the project site. Therefore, a potential exists for the circulation of [return] water. Again, well design would prove to be the critical factor to preclude such a scenario. Based on the in-situ salinity profile from the existing borehole (Table 2), the groundwater configuration is entirely saline. Therefore, the potential for contamination of fresh groundwater resources does not exist. • Leakage from abstraction and discharge pipe networks onto the land surface. Potable groundwater does not exist within the project site or the immediate and surround areas. The cultural use of potable water is derived from local rainfall and stored in residential and/or small commercial water cisterns. The implementation of the proposed project would give a much needed boost the current economically struggling island of Grand Turk including the provision of long-term employment for approximately  locals and a sustainable and reliable source of potable water. The project area was previously used to abstract saline groundwater as feedwater for a reverse osmosis desalination process (Hydroponics Plant). Neighbouring settlements will not be displaced or inconvenienced by noise, hazardous waste or increase in traffic flow. Deep Well Extraction of Cold Water - In order to source water of approximately 15 degrees C, it will be necessary to drill wells approximately 500 metres in depth. 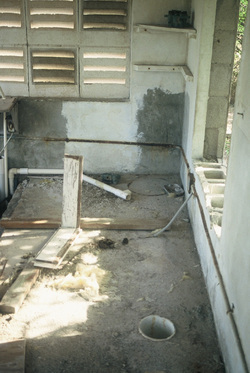 The quality of water is suitable for the intended project. However, the zone of investigation did not yield ideal temperature measurements. Target temperature measurements could be obtained at deeper depths, given the existing reverse geothermal gradient. Drilling deeper would result in improved water quality and reduce the source of pollutants from hydrogen sulfide and turbidity. • Deep Well Disposal of Return Water - The [return] water will be disposed of into four deep wells of approximately 250 feet in depth. These will be cased to a depth of two-hundred feet in order to reduce the potential for deterioration of the well walls and surrounding bedrock. • Well Design - The extraction wells will be designed to meet the necessary requirement for their industrial use and public safety. The four, approximately 500 metre deep wells will begin with a 10-inch borehole to 100 metres then continuing as a 4-7/8" borehole to the final depth. These boreholes, reamed out to 7", will be cased and fitted with submersible pumps with a capacity of 1000 US gpm. • Drilling - The preferred drilling method is reverse air circulation. This drilling method is environmentally friendly and prevents flooding of the drill site, which in the case of saline waters would result in the destruction of vegetation and loss of terrestrial habitat. A monitoring program should be established and implemented at the expense of the developer. This program would keep a record of all drilling logs and water quality reports including production figure(s) from individual wells, volumes of [return water] injected, salinity and temperature of feedwater and [return water]. Monitoring should occur on a daily basis, compiled in monthly reports and shared with the Ministry of Natural Resources. Terrestrial environment - The construction of feedwater well(s) and disposal well(s) will not result in the loss of habitat in the terrestrial environment. Site selection - The project site is appropriately zoned for the proposed development. Water quality - The quality of water is suitable for the intended project. However, the zone of investigation did not yield ideal temperature measurements. Target temperature measurements could be obtained at deeper depths, given the existing reverse geothermal gradient. Drilling deeper would result in improved water quality and reduce the source of pollutants from hydrogen sulfide and turbidity. Drilling - The preferred drilling method is reverse air circulation. This drilling method is environmentally friendly and prevents flooding of the drill site, which in the case of saline waters would result in the destruction of vegetation and loss of terrestrial habitat. Approved by CIDA-INC April 2002.